day and it followed me home! After a little playing with it, I find the 24" length is great. I like it much better than the 12" one. But, with extra length comes extra chances for movement. This is a life saver for quilters. Cheap $1 roll of Dollar Store shelf liner. the good kind is too thick and props your rulers up to high. I can't take credit for this idea. It's the best tip ever. pick it up to move it. I taught myself how to bind left handed yesterday! Only 1/4 left to finish! You are truely amazing. I love that your cast matches your shirt. I'm very impressed with the left handed binding. VEry glad that you are progressing so well. You go girl!! It is amazing what you can do when you put your mind to it. I am happy to see you doing so well. I think I need to check that cutter out. It might just replace my rotary cutter since I have been cutting strips and squares. It's nice to see you have found a way to overcome obstacles. Sew happy your back in the saddle! Praises for healing and figuring things out left handed! Thanks for the tip, my mom has both sizes of those cutters and I'll share your tip with her! 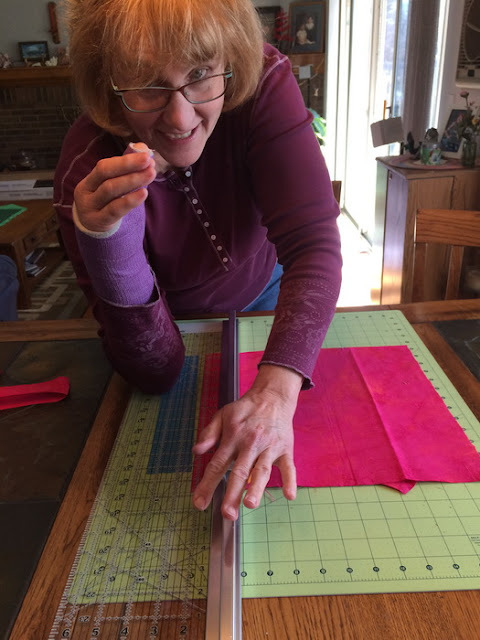 great to see you cutting and quilting again!! where there's a will, there's a way! You are one of the most amazing people I have ever known... Now, there are no dollar stores here in Italy.. could you send me on and I'll send you something back, or just pay ya.. I need the shelf liner.. I bought that cutter awhile ago on Nancy's Notions, Mine is also 22-24-inches... I've never used it, but I've thought about it.. I should definitely get it out of the box and put it to use. Isn't that cast coming off next week? Your talents are never ending!!! Now YOU are definitely a quilter that doesn't let anything stand in your way!! Have fun Joan and thanks for the tip about the shelf liner. I also use a piece under my foot pedal to keep it from moving all over the place. That is a great idea, thanks! Though I'm sad you're in a cast, I think you're pretty cool to have a purple one!